There’s nothing more comforting than a stack of warm, fluffy pumpkin pancakes. Their heavenly aroma of nutmeg, cinnamon and pumpkin pie spice reminds us of the most magical parts of fall. 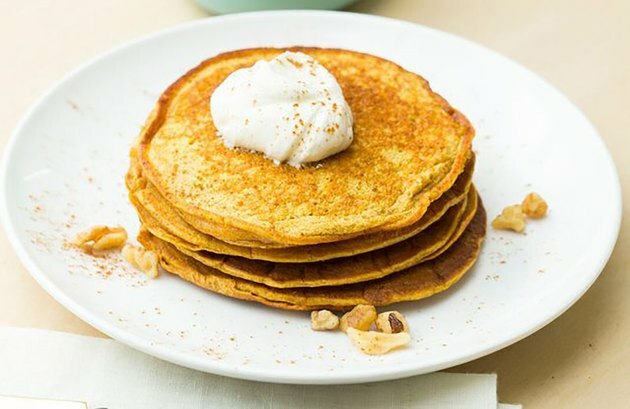 Our recipe for pumpkin spice protein pancakes uses chickpea flour in place of all-purpose flour, which means these cakes are gluten free and rich in fiber and protein. Beginning your morning with a protein-packed breakfast not only gives you the energy you need to start your day, it can also help keep your appetite in check throughout the day. Instead of whole milk and butter, we use coconut milk and ghee in the batter, so that folks with a lactose allergy can enjoy a stack of these anytime (just make sure to leave off the Greek yogurt topping). When it comes to toppings, crushed pecans are always a good pick, considering they’re high in omega-6 fatty acids, which can help reduce the risk of heart disease. Drizzle your pumpkin pancakes with warm maple syrup, grab a cup of coffee and enjoy the heck out of your morning.